UNMATCHED PERFORMANCE! Unlike plastic outdoor hose nozzles which crack and break easily, our heavy duty hose nozzle is made from SUPER STRONG Zinc Alloy with a chromed plated finish providing you with a durable, rust free long lasting garden hose sprayer. Plus we have added 2 extra rubber washers for added longevity & 3/4\" Garden Hose Thread (GHT) male and female connectors for easy quick connect setup. GETS THE JOB DONE! If you are looking for a spray pattern hose sprayer that can handle all your gardening needs then your search is over! That\'s because this gardening hose nozzle has 10 spray patterns with a simple 360° rotating sector to quickly change to any watering task, from watering delicate flowers to spraying dirt and grime from your car. EFFORTLESS WATERING! 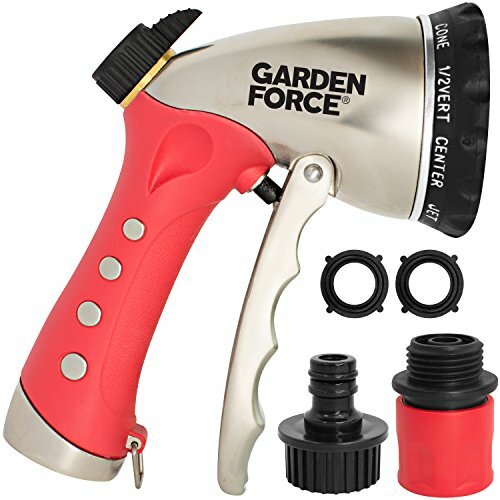 Because our Garden Gun Nozzle has a smooth-moving pressure flow thumb control knob, you\'ll be able to control the water pressure to go from watering delicate plants to watering the lawn without touching the tap. EASY TO USE! Our metal garden hose nozzle has non slip rubber handle coupled with the ergonomically designed pistol grip metal trigger giving you more comfortability while watering and the added feature of the trigger latch that locks the trigger in position for continuous water flow with little effort. TRUSTED BY PROFESSIONAL GARDENERS! 1-YEAR MANUFACTURER WARRANTY protects your investment. This possibly is the Best Garden Hose Spray Nozzle you will ever own! ORDER YOURS TODAY!